This quiche recipe is incredibly versatile – if you’re so inclined, replace the 1 1/2 c. of ham with whatever filling you’d like. For you vegetarian lovelies out there, try mushrooms, spinach, swiss chard, shallots – anything you put in an omlette can go in a quiche. In fact, for a vegetarian delight, try my Green and Gold Quiche, a tasty blend of mushrooms, spinach, shallots and sharp white cheddar. 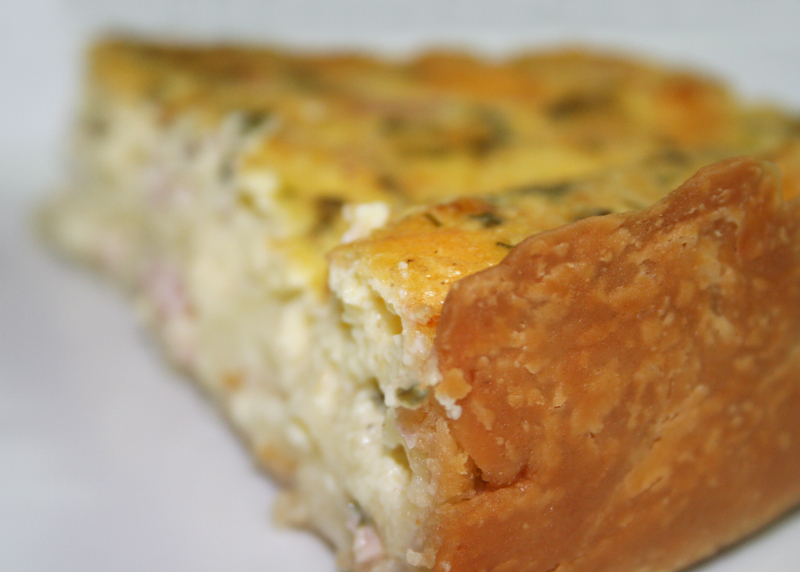 It’s not at all traditional, but equally grubworthy as this Quiche Lorraine. I’m all about pie crust from scratch, but if you want semi-instant gratification, pick up a box of the peel open-roll out pie crust in the box to save yourself some time. Pillsbury makes a perfectly fine one, and it’s easily available in the dairy aisle near the croissants and other mish mash. You can also get the frozen pie crusts premade in the tins, but I don’t like these as much for a couple of reasons – you have to wait to defrost them and you can’t control the depth of the quiche. The frozen shells are rather shallow, whereas I like to use a 3in. deep round pan for mine so that it comes out high and gorgeous. (You can insert your joke about being high and gorgeous right here.) If you do use the frozen shells, this recipe makes enough filling to make 2 quiche (which is good, because the shells come in twos). One more option, if you want to go all fancy pants at your next cocktail party, get the aforementioned refrigerated pie crust and press small rounds of it (you can tear and meld the crust – the dough is forgiving) into greased muffin tins. Fill each tin with a small amount of filling, bake until set and serve to your friends with champagne. And invite me over – I want some quiche and champagne as well. Preheat oven to 400°. Grease a 9 x 3 in. round cake pan and press the pie crust into the pan, forming high sides. Add the ham and swiss to the pan. In a medium-sized bowl, beat the eggs, cream, salt, white pepper, black pepper, nutmeg and chives until blended – do not overmix or your quiche will blow up into a weird soufflé. Pour egg mixture into the pan and place in the oven. Bake for 45 minutes until the middle of the quiche is set and no longer wiggly, and the top is lightly browned. Let rest for 5 minutes and then slice and serve.